March 16th is National Artichoke Hearts Day, but today, the first day of spring, we take on the whole fresh vegetable, a spring arrival. The artichoke is actually a large flower bud. If left in the field, the fuzzy choke in the center becomes the blossom (photo #3), which is supported by the thick, spiny leaves. The familiar globes are harvested prior to flowering (photo #4). The outer leaves, heart and stem of the artichoke are equally (and similarly) tasty. The toughest outer leaves and the choke (the light, fibrous section on top of the heart) are discarded. Artichokes can be braised, fried, grilled, roasted or stewed; but to cook a whole artichoke, the technique is to steam. The process is actually very easy. All you need is a large pot and a steaming tray. Serve them as a first course, hot or cold, with your choice of dipping sauce. Our pasta pot fits six large artichokes. We like them large, as you get more to eat with the same amount of effort. While many retailers chop the stems off, we look for those with the longest stems. Surprise: The heart grows from the stem, and the stem tastes like the heart. Don’t throw them out: Enjoy them! Some people peel the stems first, as they do with asparagus. We find that most do just fine with some extra steaming. As a hedge, you can cut the stems and steam them separately, in case they need some extra time in the pot. 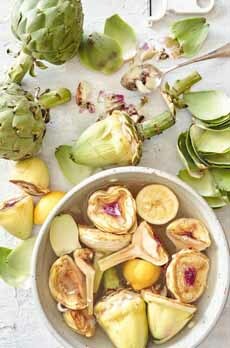 Finally, artichokes have traditionally been served with the melted butter (with hot artichokes) and aïoli or vinaigrette (hot or cold artichokes), we find that most steamed vegetables are delicious without anything else. A large artichoke (162g, 5.7 ounces) has just 76 calories. 1. PEEL off some of the tougher outer leaves. While some people undertake a severe removal, we recommend steaming more rather than less. Steam the artichokes until you can easily pull off one of the outer leaves, and taste it. If it’s soft enough to scrape off with your teeth, you get more artichoke! 2. With a scissors, snip off the thorny ends of the leaves. This is the most time-consuming part of the preparation. (Our colleague Ruth, the consummate crafter, uses pinking shears.) With a sharp knife, cut the off top center of the globe—the small, thorny leaves that are inside the large ones. 4. FILL the pot with water up to the bottom of the steamer basket, and add a tablespoon of salt. Place the artichokes in stem side up. This enables the steam to get into the interior leaves, and allows you to test for doneness. 5. COVER the pot and bring to a boil. Steam until until the heart (the bottom of the artichoke where it connects to the stem) is tender when pierced with the tip of a paring knife, and inner leaves pull out easily, 25 to 35 minutes. Check in the latter half of steaming and add more water to pot as necessary. 6. SERVE hot or cold with a ramekin of melted butter or vinaigrette and a lemon wedge. Garnish with fresh herbs as desired. If the bottoms of the globe are level (i.e., no protruding stem), you can stand them up on a plate for presentation. Otherwise, present them on their side. Artichokes are members of the thistle family native to the Mediterranean region, that are cultivated as food. 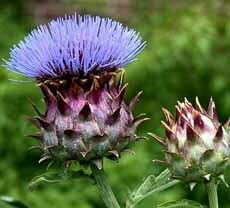 They were bred from their lesser-known cousin, the cardoon (photo #5). The familiar globe artichoke, Cynara cardunculus var. scolymus, is a variation of Cynara cardunculus, the cardoon. Cynara is a genus of thistle-like perennial plants in the sunflower family. 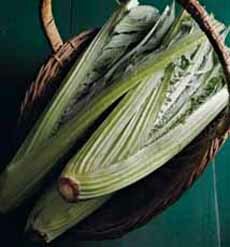 Cardoons are long, edible stalks that are similar in flavor to the artichoke stalks. The tops and flowers are also very similar. The difference is that the artichoke has an edible heart within the leaves on top. Artichokes were first cultivated thousands of years ago in Maghreb, the region of North Africa west of Egypt, where they still grow wild. They spread throughout the Mediterranean. 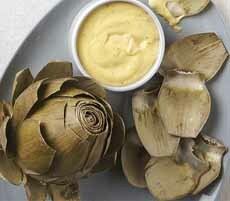 Fresh artichokes from California, cut up for a recipe (photo courtesy Good Eggs). Steamed whole and served with aïoli (here’s the recipe from Fine Cooking). 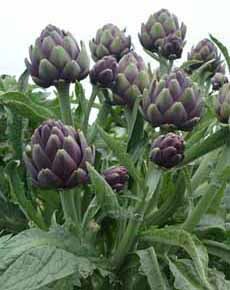 In the field, artichokes grow on long, thick stems (photo courtesy Frieda’s Produce). A flowering artichoke (photo courtesy Sierra Flower Finder). Cardoons, which look like celery (but are no relation), are the predecessor of the globe artichoke. There is no heart; the stem is what’s eaten (photo courtesy Fine Cooking). The earliest references to artichokes appear in the 8th century B.C.E. Both Homer and Hesiod, a Greek philosopher and naturalist, wrote of them as cultivated plants. Theophrastus (371-287 B.C.E. ), the successor to Aristotle, wrote of artichokes being grown in Italy and Sicily. Ancient Greeks and Romans considered artichokes a delicacy and an aphrodisiac. In the ensuing centuries, they were grown in Italy, France and other areas of Europe. They were among the fruits, vegetables and animals brought to the New World by colonists. Martha Washington’s Booke of Cookery contains a 17th-century recipe entitled “To Make Hartichoak Pie.” In the early 1800s, French immigrants settling in the Louisiana Territory planted artichokes. Artichoke lovers: Give thanks to Mr. Molera for the popularity of artichokes in the U.S. Spinach and artichoke dip is one of the most popular dips in the U.S., so it’s surprising that we can’t find information on its origin. If you know it, please let us know. Our mom recalls that in the 1950s or 1960s, a recipe appeared on packages of dry soup mix or a sour cream.